Boston Cream Pie is my all-time favorite kind of birthday cake. August 11 is my birthday! If I could choose any kind of birthday cake in the whole world, I’d choose Boston Cream Pie every single time. In fact, I’m a lucky girl. I do get to choose my birthday cake every single year. My parents have a tradition of letting us choose our birthday meals, which includes the cake of our choice. You may remember back in March when I posted about Don’s birthday cake of choice: lemon cake, which is great, but it’s not Boston Cream Pie by any means, and that’s *my* favorite. 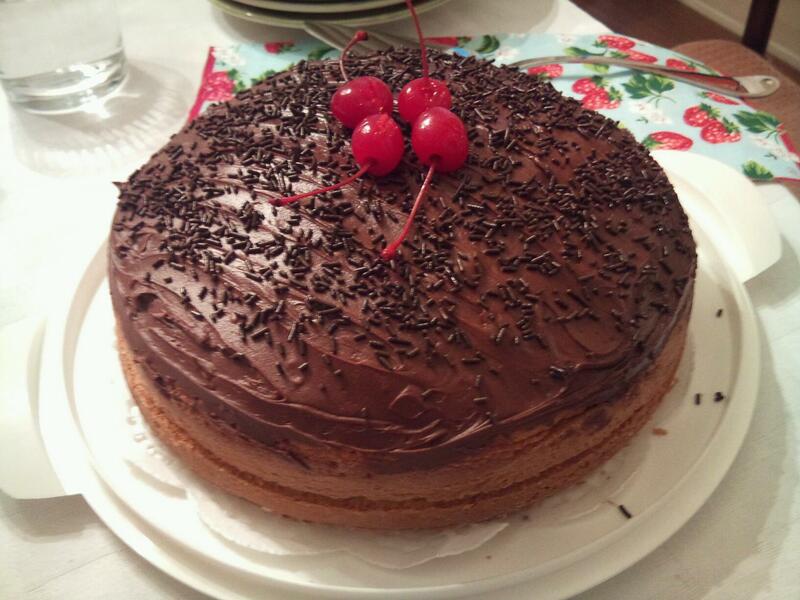 For as long as I can remember, my mom used a recipe for a “quick” Boston Cream Pie, which uses a cake mix, pudding mix, and a decadent chocolate frosting. Then, in 2006 my mom happened upon a “from scratch” recipe for a Buttermilk Cake which she uses for her Boston Cream Pie, in a magazine that Hallmark used to put out. So, as my gift to you for my birthday, I’m giving you both recipes. They’re both good and there are times when you really just need a quick recipe versus times when you can go all out. I personally have never made the from scratch recipe, but I’ve eaten it. Treat yourself to either one on your next birthday. You’ll be glad you did! Mix and chill until solid. When cakes are cooled, spread filling on one layer, top with the second layer. In small bowl, mix together all frosting ingredients except for hot water. Add hot water one tablespoon at a time until desired spreading consistency has been reached. Top with cherries and/or sprinkles, if desired. Butter layer cake pans and line with parchment or waxed paper. Butter the paper. Beat the butter and sugar in a large mixing bowl with electric mixer for five minutes at medium speed until light and fluffy. Beat in eggs one at a time. Scrape the sides of the bowl and beaters and beat well to incorporate. Sift the flour with the baking soda and baking powder. Add one quarter of the butter mixture to the butter-egg mixture then add vanilla and one third of the buttermilk. Repeat, beginning and ending with the flour mixture and scraping well after each addition. Pour the batter into the prepared pans and spread to edges with spatula. Bake 25 to 30 minutes or until a toothpick inserted into the center comes out clean. Cool in pans on rack for five minutes. Turn pans onto rack, remove parchment or waxed paper and cool completely before filling and frosting.